Whenever I make rice, I am always left with leftovers. I know that rice absorb cooking water, usually a cup of rice expanding to two and half cups of cooked rice. Nevertheless, I feel the need to make extra rice due to my deep rooted cultural upbringing that taught me that extra rice is next day’s fried rice but having not enough rice is a major food faux-pas. Fried rice is technically “stir” fried rice because rice and other assorted accompaniment are quickly stirred in a small quantity of hot oil. 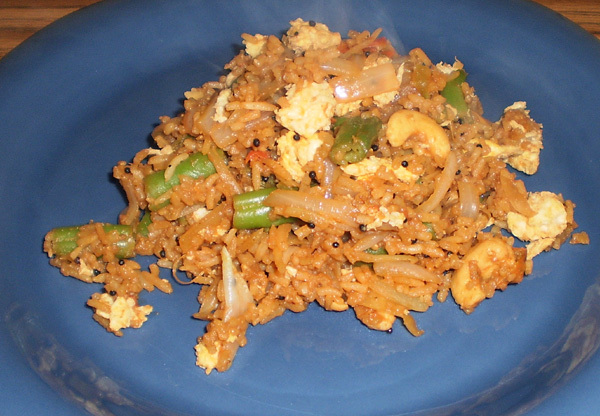 Americans generally think of fried rice as a typical Chinese cuisine or at most the oriental dish. However, there are more variants of fried rice from around the world. I would argue that pilaf from Middle East, pulau from Indian subcontinent, paella from Spain, arroz frito from Cuba, and many more are also, in essence, “stir” fried rice. Popular variation of Asian fried rice in this country include; generic (insert name of meat) fried rice from Chinese takeout flavored with soy sauce and oyster sauce; Indonesian (Nasi goring) from flavored typically spiced with shrimp paste and chili; Thai fried rice (Khao Phad) seasoned with soy sauce and fish sauce. Fried rice is a versatile dish found in any country where they eat rice and have leftovers. The seasoning defines the fried rice. For example, in Nepal fried rice, pulao, has yellow turmeric as the dominant flavor. Similarly, depending on the region, type of rice used is changed. Paella uses bomba rice because that’s what grows in Spain, Indian pulau use basmati because it’s native to India, and Chinese fried rice use their own short grain glutinous sticky rice. I prefer free flowing rice instead of sticky rice. Most long-grain rice varieties are free flowing, and my favorite is Basmati rice from Costco. Basmati, which means with the fragrance, is a variety of long grain rice grown in Indian subcontinent with aromatic smell and fluffy free flowing texture. Fried rice is versatile dish. 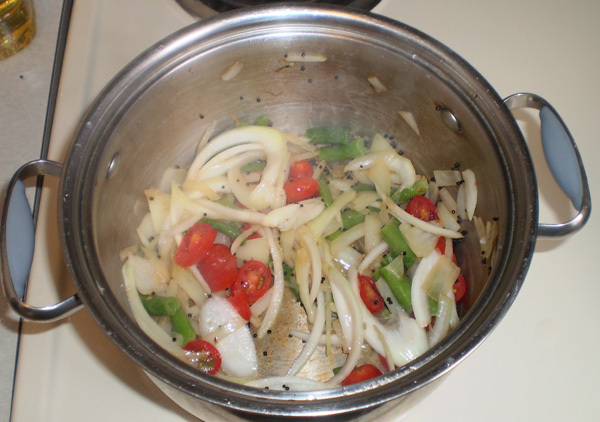 You can make your own depending on seasonings and ingredients you have or you are craving. For a few weeks I was fascinated with whole mustard seeds as a spice. This is how I made my own mustard fried rice. Start with a day (or a few) old refrigerated rice. Use your hand to crumble and separate the dry rice. Sprinkle some water if you see need for. Fry spices if roasting of spices is needed. Even it’s called “fried rice”, I recommend not using more than few tablespoon of fat (oil). 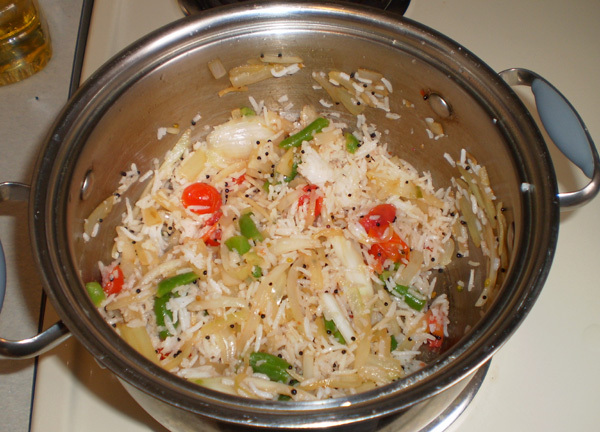 To make sure rice is not sticking together, add lot of fresh or frozen vegetables. They are good and they add moisture and texture to rice thus preventing sticking together. The choice of vegetables depends on availability and likability. Many run off-the-mill vegetables, such as broccoli, sweet peas, onions, carrots, zucchini can go in fried. Here I added frozen green beans with fresh onions and tomatoes because that’s what I had. I don’t like carrots in my fried rice because it gives more sweetness than I prefer (maybe a good candidate with fried rice with sweet barbeque sauce). To make a balance diet out of your fried rice dinner, add proteins. It can be bite size pieces of any meat, even sausages, seafood such shrimp, or even tofu. Make sure you cook protein appropriately. Most people tend to overcook the seafood such as shrimp making it chewy. If I am not lazy about washing an extra utensil, I prefer cooking meats to very rare in separate utensil and then adding it. While for shrimp, add few minutes before done. 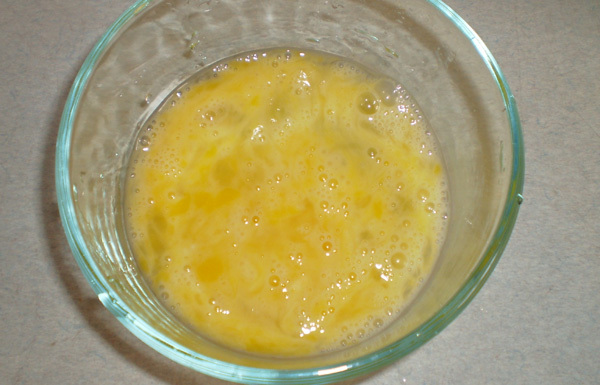 Here, I microwaved beaten eggs for 45 seconds to get protein for my fried rice. Seasoning depends on type of fried rice you are making. Internet is full of recipes for different kinds of fried rice. After going through couple of online recipes for the specific fried rice, you will realize there is common key signature seasoning. Healthy dose of experimentation with amount (within the prescribed limit set in online recipes) will be needed to get to your own liking. For example, Indonesian fried rice has shrimp paste and some sort of sweet sauce, you may want to customize these ingredients to your own need. Here, I added few roasted mustard seeds, pinch of mustard powder, dash of Grey Poupon’s dijon-style mustard, and light soya sauce. I hope I have encouraged you to experiment with your own fried rice. This looks great! I love rice so I always fill up my rice cooker whenever I made it. This will be perfect with the vegetables from my garden this summer. @Shiela, it will be indeed be better with some fresh homegrown summer vegetables.